How can knowing your unique values help you? How can knowing your values help you? How often have you heard a person state: “I live by my values.”? What does living by your values really mean? Have you ever thought to ask that person, “Great, so what are your values?” Chances are, if you were to ask, you’d get a sudden surprised look. Our experience has shown, many people don’t know exactly what their values are, because they haven’t yet defined them, or even considered why they need defined and deliberate values. Occasionally someone might give us a response which lists a few common values, such as honesty, courage, or independence. And they’re good values. No one can go wrong with these, because they are socially acceptable, and–you might even say–socially expected. Don’t we all expect our loved ones to have certain values? These could almost be called “common” values, couldn’t they? It wouldn’t surprise you if people had these values, lived by these values, and stated them, would it? We all strive for these values – and sometimes fall short, but keep trying. We all hope our spouse is working on these values also, don’t we? What about unique values – those which differentiate you from other people? We’re all unique human beings – that’s no surprise. God made us all special, with gifts and talents, with ideas and drives, with strengths and weaknesses. This uniqueness shows up in the values we live. Values keep you stable when the picture changes. Last month Robert and I wrote a post for Lead Like Jesus on values. Included in that post was our experience with our own unique values. Both of us work on our common values – the expected, Christian values – but we use our unique, differentiating values as signposts along our life;s way. Life has changed a lot for us – and continues to change. We’ve gone from newlyweds to young parents, from homeschooling our children, emigrating to a new country, to having teenagers in our house and then young adults. We’ve experienced corporate life, ministry and entrepreneurship. We’ve also completed one year on-the-road traveling full-time. The next change for us – this December – will be a new title… grandparents. Yes, life changes. What remains the same? Our values. Our differentiating values. 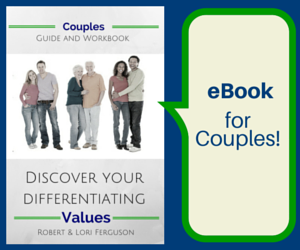 Do you know your shared differentiating values as a couple? I’m guessing you already have a hunch about which values drive you as individuals. But what about as a couple? 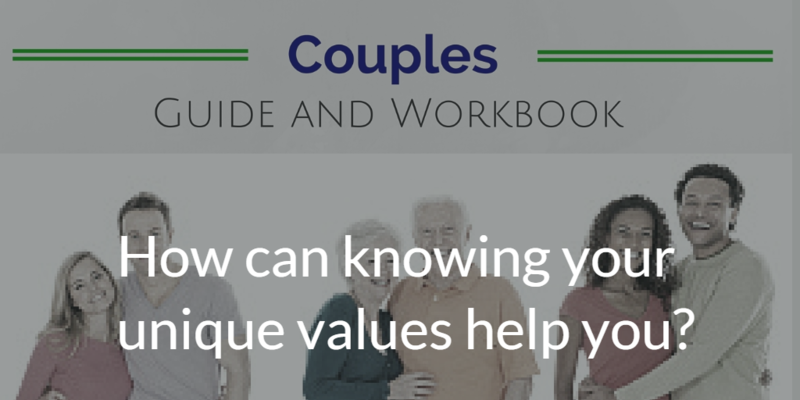 We’re back in Raleigh for a bit, and Robert is going into the studio to record an audio version (mp3) and some companion videos for the Couples Guide and Workbook to Discover Your Differentiating Values. These extras will be ready by the end of July. 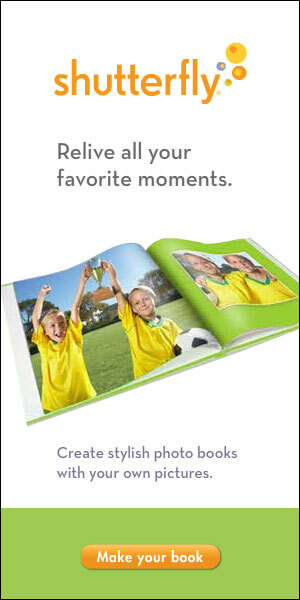 If you’d like to have these extras – at no extra cost – just order the eBook now! 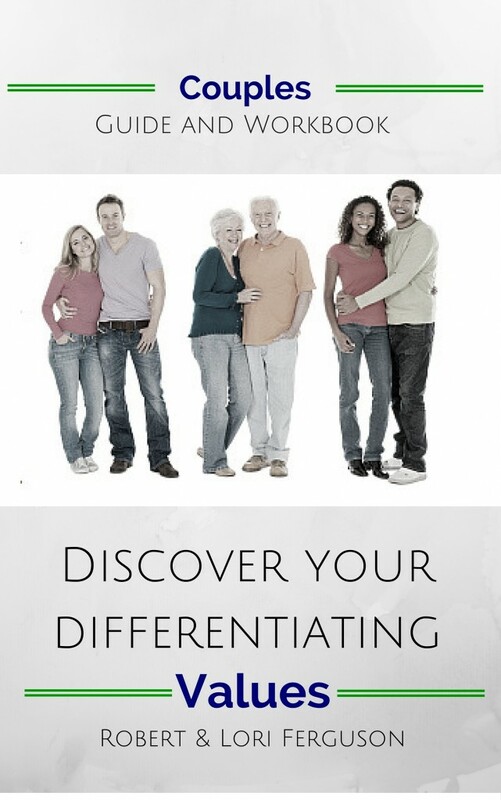 What will knowing your shared differentiating values do for you as a couple? Knowing your shared values will drive your behavior to map with what you truly value. Knowing your shared values will make it easier to make decisions – together. Knowing your shared values will lead you both to leave a significant and positive legacy for your children, grandchildren, and even your community.